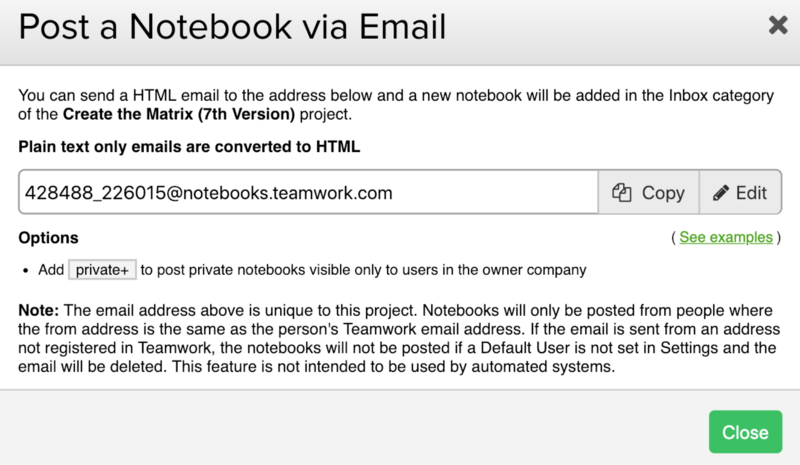 Within Teamwork Projects, you can post a notebook directly to your project via email. Go to the Notebooks area of your project. Click the options (three dots) button in the top right corner, and select Post a Notebook via Email from the dropdown menu. Note: Attachments sent will be ignored and also plain text emails will be converted to HTML via Markdown. In the post via email modal, you will see the email address for sending notebooks via email. Click Copy to copy the email to the clipboard. You can append private+ to the email address to make the Notebooks private to users in the owner company. You can append notify+ send an email to users on your project notifying them that a notebook has been added. Note: Do not use the notebook-by-email address to post notebooks from automated systems that could generate 100s of notebooks. Abuse of the notebook-by-email feature will result in suspension of the feature from your account.